The member of the homologous series called Alcohols have names which end in “ol”. Examples are methanol, ethanol and propanol. Alcohols all contain an -OH functional group attached to a hydrocarbon chain. 2) Ethanol can be oxidised in air in the presence of microorganisms (‘microbial oxidation’) to form ethanoic acid (CH₃COOH). 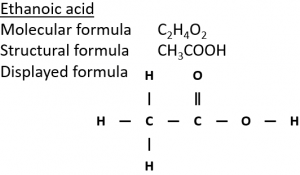 3) Ethanol can be oxidised by heating with the oxidising agent potassium dichromate(VI) (K₂Cr₂O₇) in dilute sulfuric acid (H₂SO₄). In the equation below, [O] means oxygen from an oxidising agent. This mixture starts orange but when the reaction happens turns green which indicates the presence of Cr³⁺ ions which are formed when the potassium dichromate(VI) is reduced. In the hydration of ethene, ethanol is made by passing ethene and steam over a catalyst. Water is added to ethene, this is known as hydration. Fermentation is the conversion of sugar, e.g. glucose into ethanol by enzymes from yeast. Temperature: 30°C – The process is carried out at low temperatures as not to denature the enzymes. Other: Anaerobic (no oxygen present) – if oxygen were present, the yeast produce carbon dioxide and water instead of ethanol.